NIOSH continues to conduct respirable dust control research for surface mine blasthole drilling operations. Research areas have included testing variables (shroud leakage area, drill deck cross-sectional area, shroud height, collector-to-bailing airflow ratio, etc.) that have the most impact on respirable dust control, development of a dust collector inlet hood, development of a dust collector dump point shroud, and testing of a small diameter water separating sub. This paper summarizes the results of the aforementioned research that has been completed. 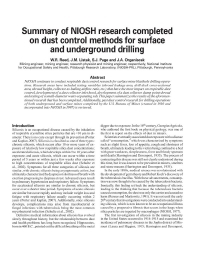 Additionally, past dust control research for drilling operations of both underground and surface mines completed by the U.S. Bureau of Mines (created in 1910 and incorporated into NIOSH in 1997) is reviewed.